The proposal that the school and the guest houses be incorporated into the site, utilizing the light, the wind, the water and the planting –all constituent elements of the Mediterranean architectural expression- was a conscious intention from the beginning of this project. This proposal involves spatial arrangements of fundamental architectural archetypes, as well as elevates the importance of outdoor life, social osmosis and the vital relationship with nature to the condition necessary to artistic creation. The weave of old and new and their incorporation in this versatile site are sought through the primal simplicity that characterizes the proposal. The forms of the proposed buildings display a distinct architectural vocabulary with regard to the existing ones, without any tendency to imitate the stone buildings or be consolidated with them. 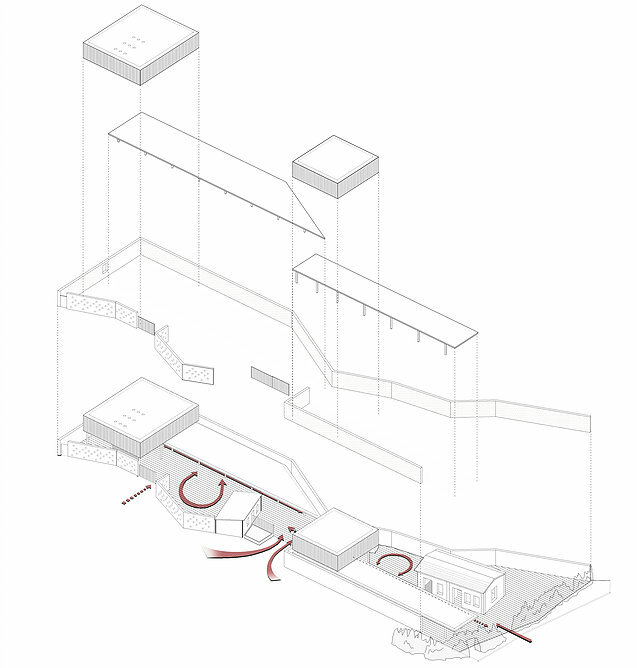 The tracing follows the natural incisions of the site. The slender building components are "touching" the ground without leveling it. Solving operational needs and building spaces of exceptional quality is achieved with minimal intervention. 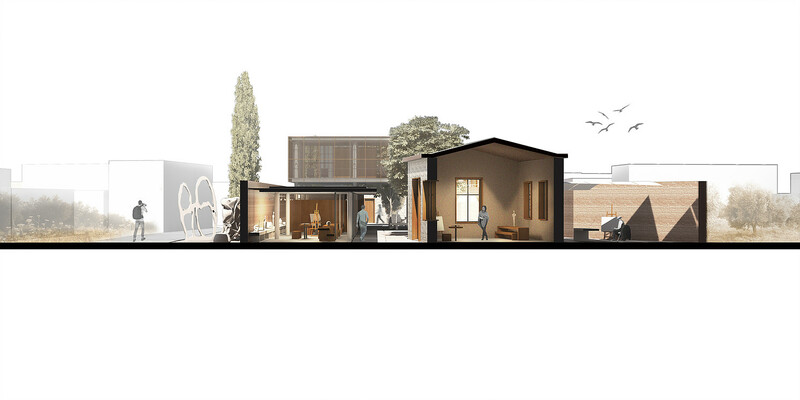 In this proposal, old and new are conversing by means of an inherent simplicity. Meanwhile, the creation of new premises to house the youth guest houses that are required for the operation of the schools is proposed to be located west to the stadium, where the existing buildings already operate as guest houses. 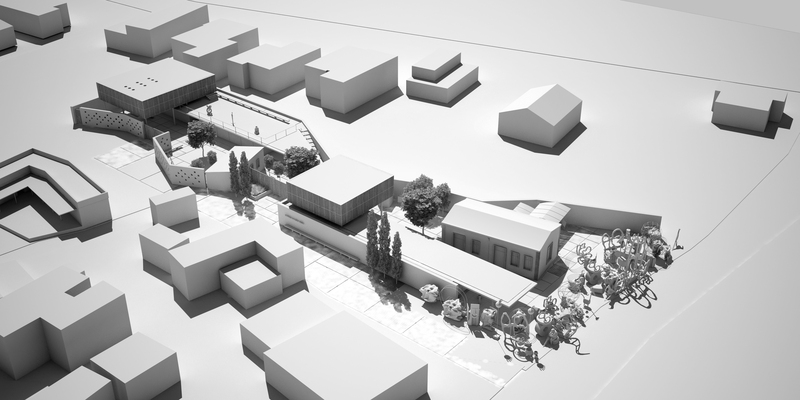 During the design of the proposal, particular attention was paid to the relationship between the school and the square, given that the new school will constitute a culture core for the community of Lemba, as well as to the connection between the guest houses and the school, and the village in general. The boundaries around the plot, where the school of fine arts will be placed, display distinct features. To the south, where the sculptures of the school presently stand, the plot borders the village’s main road and the main square, which is to be reformed. The eastern boundary is semi-detached to other properties, an abundance of buildings, distinguished by their particular oncoplastic heterogeneity. To the northeast, the plot is bordering a part of the archeological site, while most of its eastern side is adjoining a low traffic road. 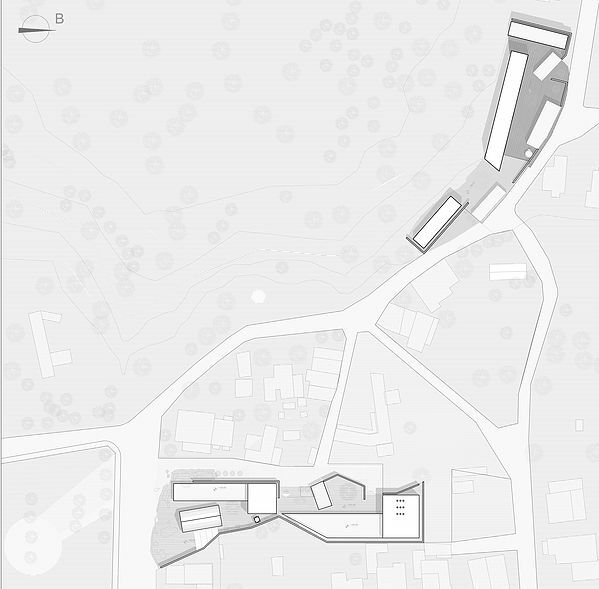 Three simple and geometrically clear lines configure the central concept and set up the proposal. 1. 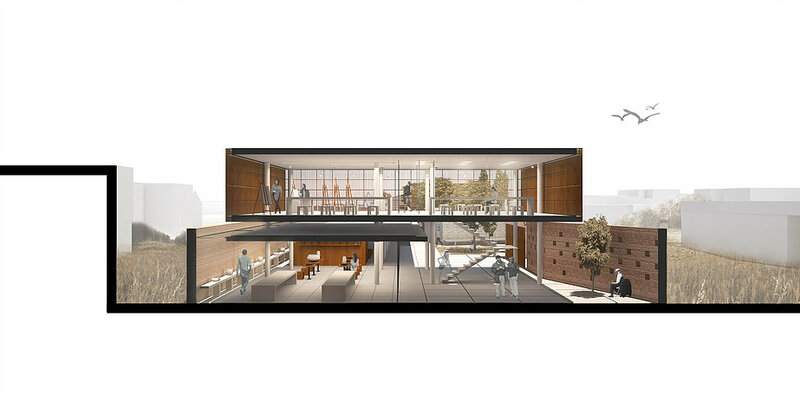 Two shear walls of compressed earth (rammed earth) in shape Γ, which follow the plot’s borders, cut off the faculty from the "pluralism" of the adjacent buildings and comprise two distinct sections. A thinner, perforated shear wall of the same material is placed at the eastern boundary with the archeological site, distinguishes the main and the secondary (auxiliary) entrance and configures the limit/filter towards the archeological site. 2. Two panels, located at a distance from both shear walls, interact with them and house closed and semi-open spaces. 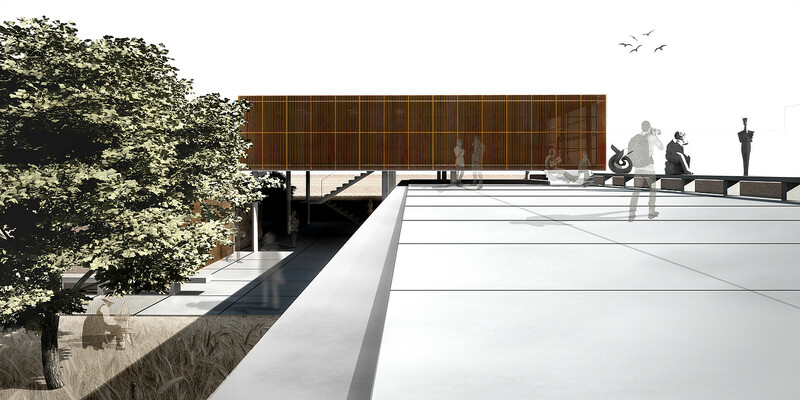 They accommodate workshops and exhibition spaces, to allow integration with the outdoor space. 3. Two rectangular prisms, exalted with regard to the two panels and the shear walls, host the administration and teaching domains, form the public facet and set up the two patios/creative condensers, thus completing the composition. It is suggested that the guest houses of Cyprus Art College be located in the western plot. The plot is linear, with a strong slope towards its southwest side. It borders the public road from the northeast and a partition wall (of different ownership) from the west, while a steep slope of dirt stands out in its southern part. Approaching the plot synthetically, we set three objectives. - The balance between extroversion, which should be made available to public (living room, kitchen, dining room) and outdoor spaces of such a complex, and the privacy that each separate habitation requires. - The distinction of two housing sections (teachers \ students - visiting artists) and their organization in two potentially independent units. - The achievement of the aforementioned objectives, expressed in the inherent simplicity that characterizes the suggested school facilities, not only with regard to form , but also following the logic of resolving operational requirements with minimal intervention in the site. 2. 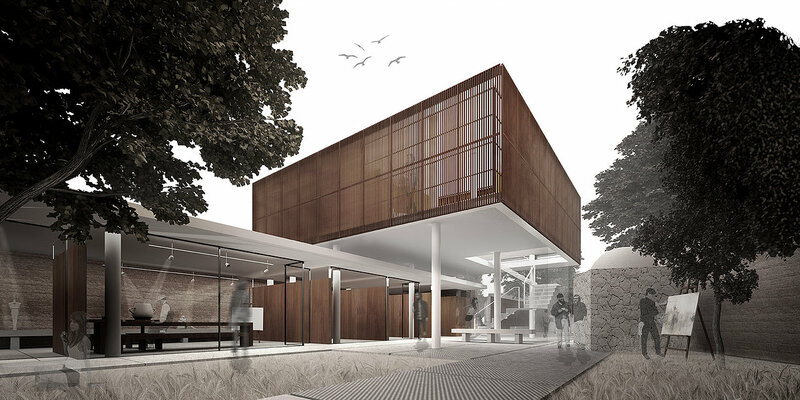 A shear wall, made by armed compressed earth (rammed earth), will be placed at the plot’s boundaries with the public road and the partition wall, thus disrupting the connection with the road, filtering nuisance and providing a visual outlet towards the midday and the scenery. 3. Two pillars are located at a distance from the perimeter shear wall, housing guest houses and semi-open spaces. A linear prism “connects” the two levels and, in combination with the existing buildings that are reused, the open spaces are organized. The movement and access at closed and semi-open spaces is traced around them. 4. A uniform line is set, starting from the main entrance (east) and ending with a proposed small amphitheater (southwest). It consolidates the two levels of the plot and organizes the movement/ access throughout the composition. In this context, it becomes the backbone of the synthetic proposal, while its extension leads to the main entrance of the Fine Arts School.